Eager to wish the little master - Sachin Ramesh Tendulkar all the best for breaking and surpassing record of another legend - Brian Charles Lara (Test cricket's highest run scorer) in an ongoing Gavsakar & Border Series? The ace batsman, who is only 15 runs short of overtaking Lara's mark of 11,953 runs.Everybody knows that Sachin Tendulkar holds so many records and this will be one addition to his long list. We know Brian Lara record is going to be broken one or the other day and that day is now not far off. And i believe every Indian and cricket lover should be happy that the record will be in the possession of the player as good as Sachin tendulkar,who is more than living legend for me in cricketing world after Sir Don Bradman. Tendulkar who has terrorized bowlers across all nations for years now is still going strong and i wish him he breaks all the records and continues to rock the cricketing world like he has been doing for the last decade. All the Cricket fans/enthusiasts its your turn now to post your messages wishing master blaster Sachin tendulkar good luck. Congrats.. for your excellent,consistent and greatest achievement in the field of sport. Only you can do this.very very heartly congratulation to you. We wish you to across the 15000 before retierment. sachin - u are the best. here's hoping u notch up many more tons and keep breaking/creating records. we love u and want to watch u win the world cup. all the best little master. you are the GOD of cricket. Sachin am just sooooo crazy about you. Wish u a cracker of a series in Kiwi-land. Congrats and good luck. 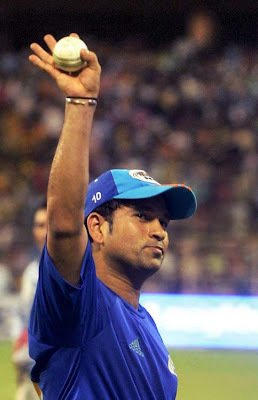 Congrats tendulkar for hitting exellent centuries .you are the evergreen LEGEND for the world cricket. Best of luck to have few more good centuries for the team and for you.